Thanks of its geographic position and the presence of Brindisi, Otranto, Bari, Trani and Barletta ports, Apulia has been a transit point for many Jewish exiles -most heading to Israel. This crossing point therefore made of Puglia a privileged region for the Western Europe diaspora. The first evocation of a Jewish presence in Puglia was written by Rabbi Akiva (17-137): en route from Jerusalem to Rome to plead the cause of the Jews of Jerusalem to the occupant, Akiva made a stop in Brindisi as mentioned in his diary. Not all the Jews who settled in Apulia arrived directly from Palestine, as refugees from Jerusalem. Some arrived by sea from the Balkans, others from Spain and Portugal, or overland from France, Central Europe and other parts of Italy. In Apulia they assimilated with existing groups, creating a Judaism with its own unique profile. Traces of Jewish multiculturalism in Southern Italy are everywhere evident in the collection of annotations of the Pentateuch known as Sefer ha-Yashar (Book of the Righteous), that is believed to have been compiled in Naples in the late fifteenth century from pre-existing materials – the authors taking their cue from the narrative sections of Genesis and Exodus, to tell parallel stories that occurred in other periods and areas. One of the central themes of this work is the migration of peoples. It explains, for example, that the population of Apulia and Italy all originate from biblical figures; and that Aeneas – the founder of Rome – was closely related to the patriarchs. Their tendency to draw parallels between different cultures shows that the Jews of Southern Italy were not closed to the traditions of other peoples, and that their ability to adapt was considerable. 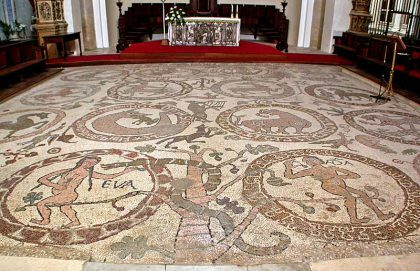 An interesting illustration of the kind of multiculturalism that distinguished Medieval Apulia can be found in the decorative plan of the mosaic floor of Otranto Cathedral – the work of a twelfth-century Byzantine monk. The author fused elements drawn from the Bible and other Jewish narratives (similar to those that make up the Sefer ha-Yashar), elements that are rooted in a multi-ethnic culture, where Neo-platonic and Aristotelian traditions coexist with mythological material derived from Celtic folkloric literature. Realized during the Norman Era, this work is a tribute to the great Byzantine capacity for cultural synthesis that the new rulers sensibly adopted – doubtless to safeguard the diverse heritage of their newly conquered territories. As time passed and dynasties succeeded one another, the centralization of culture in the capital led to a weakening of Jewish culture in the peripheral areas of the kingdom. This phenomenon may also be associated with instability due to socio-political feuds. The social composition of the community continued to change. At the time of the transition of power from the Byzantines to the Normans, many Jews migrated to northern Italy and from there to the Rhineland, where they contributed to the formation and enrichment of Ashkenazi liturgical and philosophical traditions. After World War II, Apulian Judaism got a new lease of life for a few years between the end of the conflict and the establishment of the State of Israel, when thousands of Jewish refugees from central and Eastern Europe and the Balkans, mainly survivors of Nazi concentration camps, stayed in the transit camps managed by the United Nations. To prevent them from reaching Palestine, the Allied Forces temporarily relocated them to Santa Maria al Bagno, Santa Maria di Leuca, Santa Cesarea, Tricase, Bari, and Barletta where they immediately recharged community organizations, religious schools and political institutions.